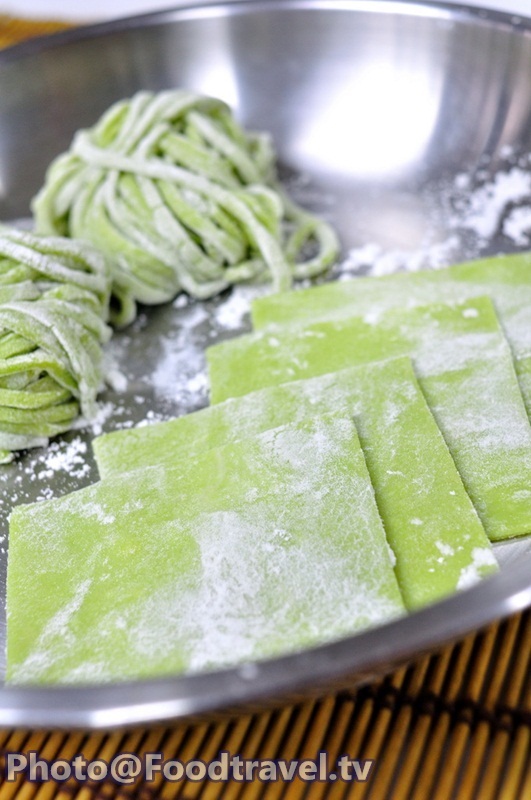 How to Make Green Noodles and Green Wonton Sheet - Today we will make a green noodles and green wonton sheet at home. Of course, the taste will different from noodles store. You can change to any kind of vegetables as you like. 1. Chopped kale into small pieces. Then pour to combine with water and mix in a spinning blender until fine. 2. Filter finished spinning ingredients (use only the water) Add the flour into a mixing bowl. Make a hole in the middle of the flour. Then add eggs and beat it. Mix well together with flour. Then slowly pour the water from the kale into small increments and mix well. 3. Cover the dough with plastic wrap. Set aside at room temperature for 30 minutes. 5. Cover the dough with plastic wrap. Set aside in refrigerator for 1 hour, then cut into half. (for making wonton sheet) Roll it into 1 ml. thin sheet. 6. Fold the dough into 3 layers. Cut into 2ml. thick. 7. Stretch out the dough. 8. Roll the dough into a loaf not too tightly. 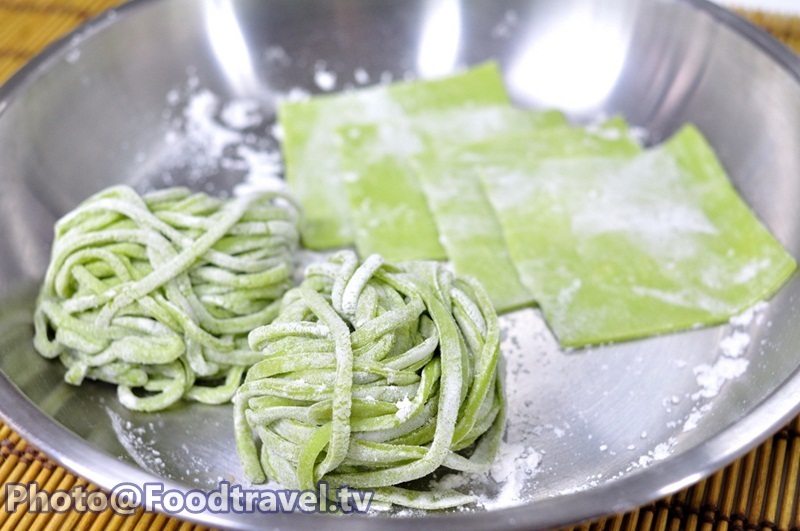 Sprinkle flour all around the noodle. Then cover with plastic wrap and set aside in the refrigerator for 1 night. 9. Rolled the rest of dough into thin sheets (not over than 1 ml. thick) Cut in 3x3-inch size sheet. And finally sprinkle flour all around.